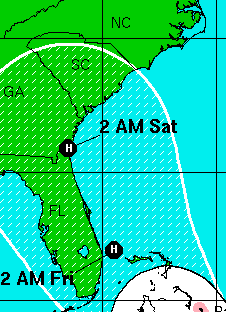 The map above is from the National Hurricane Center in their 5am EDT advisory. I would be including the southern North Carolina coast in the hatched area had I been making the forecast. We both agree that Irene will probably be a major hurricane (Cat 3 or higher) if it makes landfall in Florida or Georiga and may be a major hurricane if it makes landfall in the Carolinas. While it is too soon to forecast an exact path or exact intensity, I would urge people to see the preparedness suggestions in the posting below.